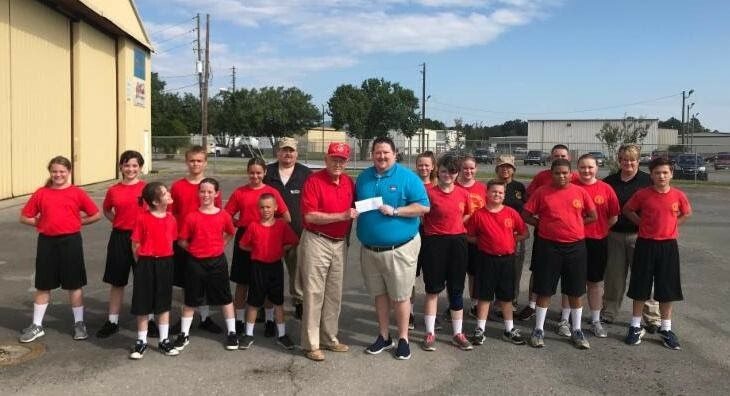 The Exchange Club of Rome has stepped up to help several members of the Young Marines of Greater Rome by providing funds to purchase these young people uniforms they could not afford on their own in order for them to participate in the program. Rome President-Elect Patrick Eidson presented a check for $700 to Rome Exchangite Dr. Bob Williams, who is a member of the Marine Corps League and an advisor to the YM contingent. The $700 will buy 2 uniforms. There were 3 students in need and someone else bought the 3rd one. In making the presentation, the Club made special note of how this program helps develop character, leadership abilities, and the support of our American ideals in young ladies and gentlemen from age 8 to 18.